Most Air Conditioning (AC) systems that blow warm air can have a variety of problems causing hot air from vents. With an initial Air Conditioning (AC) test, the service technician will report on the condition of your car’s Air conditioning (AC) system with a comprehensive evaluation. If freon is lower than specification, an Air Conditioning (AC) dye will be added along with the required freon. The service facility will recheck the system with the Air Conditioning (AC) dye and freon administered with an ultra violet light that will enhance any leaks under ultra violet light. If no leaks are present, your service advisor will schedule a recheck usually in a week. If at this time, no leaks are apparent, the system should fair well through the summer, provided that no additional faults occur. REMEMBER, have your car’s air conditioning (AC) system evaluated before adding freon! There are many other factors that can cause issues with the performance of your car’s air conditioning (AC) system. The above issue is one of many faults that can arise during testing. Many car repair facilities will add refrigerant and your car will blow cold air…. for a short period!! Avoid this, by demanding a full system performance evaluation. Simply put, have your car’s Air Conditioning (AC) system tested for possible leaks or pressure issues. DOES MY CABIN AIR FILTER AFFECT MY CAR’S AIR CONDITIONING? The car’s cabin air filter is a great device that keeps your passenger compartment free of pollen, molds and all of those other unhealthy bacteria that can be produced over time from the natural process of condensation from your air conditioning. 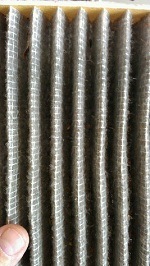 Most folks don’t realize they have a “cabin air filter” until it becomes plugged, creating an unhealthy smell in the cab and most often reducing the performance of your Air Conditioning (AC) system. Your owners’ manual should list the mileage criteria for replacement. REMEMBER: Routine replacement keeps your car’s cab and system healthy! WHEN MY CAR’S ENGINE RUNS WARM, MY AIR CONDITIONING DOESN’T SEEM TO WORK THAT WELL? It is critical that your car’s engine operating temperature run as designed. If your engine temperature starts to increase above operating temperature, your Air Conditioning (AC) system could be shutting down to conserve the increase of temperature. Maintaining your coolant system is the best approach to ‘worry free operation’ of all your onboard systems. REMEMBER: Every spring have your car’s engine coolant system evaluated! WHY HAS CAR REFRIGERANT (FREON) BECOME SO EXPENSIVE OVER THE YEARS? As with anything else, supply and demand unfortunately come in to the equation. Living in the southwest and southeast portions of the United States does create a demand and therefore, premium on cost. Manufacturers of refrigerant from time to time can be under quota for anticipated demands and furthermore drive the price up. Most automotive repair facilities will try and purchase bulk refrigerant at the right time of year so as to pass on the best price for the consumer.